NanoSail-D is now in space, following a successful launch on the 19th that involved eight satellites for university research programs and the US government. The sail experiment was carried aboard FASTSAT (the Fast Affordable Science and Technology Satellite) and is scheduled for release seven days after launch, with sail deployment three days later. We’ll soon know how well the deployment of the sail — a five second process — proceeds, but how energizing to have another sail experiment in motion as we continue to shake out this technology. The NanoSail Twitter feed (@NanoSailD) is active and bears an uncanny resemblance to the amiable, chatty and often obscure IKAROS tweets from that mission’s launch. Meanwhile, other missions continue to pop up with intriguing results, including WISE (Wide-field Infrared Survey Explorer), which has been surveying the sky at infrared wavelengths since January and is now on its NEOWISE mission, the extended sequence of observations operating without the now exhausted coolant needed to chill its longest wavelength detectors. WISE is covering the gamut, from asteroids to stars and galaxies, but now focuses largely on comets and asteroids, and those include the near-Earth objects whose orbit takes them near our planet. The latest WISE treat is a vivid look at the planetary nebula NGC 1514, the ‘Crystal Ball’ nebula discovered in 1790 by William Herschel. Have a look at these images, one from an Earth-side telescope, the other the view from WISE, and ponder how useful it is to have the WISE detectors operational in space. We’re looking at a pair of stars, one a dying giant larger than the Sun, the other a white dwarf originally formed from an even larger star. The aging of the giant star involves its losing outer layers of material to form a ‘bubble’ around both stars. 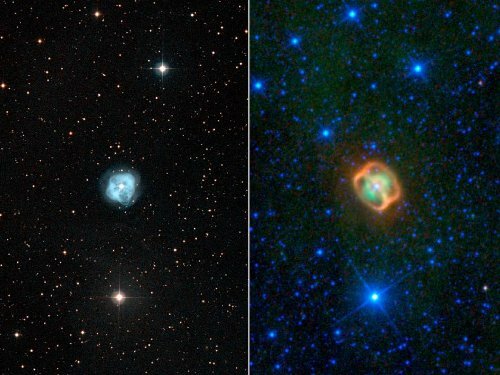 Image: This image composite shows two views of a puffy, dying star, or planetary nebula, known as NGC 1514. The view on the left is from a ground-based, visible-light telescope; the view on the right shows the object in infrared light, as seen by NASA’s Wide-field Infrared Survey Explorer, or WISE. Credit: NASA/JPL-Caltech/UCLA/Digitized Sky Survey/STScI. The vivid imagery is the result of jets of material from the white dwarf colliding with the bubble wall drawn out of the giant, creating the orange rings as dust is heated and glows with infrared light. The green cloud is an inner shell of shed material that, in the visible image, appears in bright blues (and note an outer shell in the visible light image that does not appear in the infrared). As to color coding in the WISE image, infrared light with a wavelength of 3.4 microns is blue; 4.6-micron light is cyan; 12-micron light is green; and 22-micron light is red. WISE science team member Michael Ressler puts it best: “This object has been studied for more than 200 years, but WISE shows us it still has surprises.” That’s the benefit of having infrared eyes that can tease out structure that would otherwise be obscured by brightly fluorescing clouds of gas. We can only assume WISE will be delivering up more surprises, and plenty of them given the sheer amount of WISE data that have been accumulating these past months. The first data release to the astronomical community is in the spring of 2011. “When we visited Hartley 2, it was in the midst of a cometary ice storm generated by jets of carbon dioxide gas carrying a couple of tons of water ice off the comet every second. At the same time, a different process was causing water vapor to come out of the comet’s mid-section. Mission co-investigator Pete Schultz (Brown University) likens the cloud of particles to what you would see in a crystal snow globe and adds “When we first saw all the specks surrounding the nucleus, our mouths dropped.” The findings show that at least part of Hartley 2 operates differently from other comets whose nuclei have been imaged by spacecraft, with CO2 being the key. The rough areas of Hartley 2 see jets of CO2 blasting out water ice from below to produce clouds of ice and ‘snow,’ whereas the smooth middle area of the comet is more like the surface of Tempel 1, with water evaporating below the surface and percolating out through the dust. So the smooth and rough areas of the comet appear to respond differently to heating from the Sun and have different mechanisms to get water out of the cometary interior. We get blasts of particles in one area and water vapor close to the smoother cometary surfaces. How all this occurs, and whether it’s the result of dry-ice inhomogeneities dating back to the comet’s formation or due to subsequent changes, will be the subject of further study. But what an accomplishment for a spacecraft that, target after target, continues to yield up new insights into ancient objects. The shot of NGC 1514 is spectacular. My eye was instantly drawn, however, to an object at mid-lower right in the WISE image as presented, which appears white in the color-adjusted IR spectrum but is practically invisible in the visible-light image. There is another at upper right, though dimmer in IR and much brighter in the visible. I’m assuming these are otherwise unremarkable stars which simply have brighter output in the IR band used in the WISE image… but when the topic of WISE comes up, I’m always interested in the possibility of nearby IR objects and am looking forward to hearing more.